I finished the top of the jelly roll quilt!! Whoop, Whoop....now to work on kitting up projects for the summer time. I need to get a better picture, but here is what it looks like with the borders on. I have not finalized a name or scripture to go on the back, so if you have any suggestions put them in the comments! Tomorrow I will call Betty Lewis and see if she can get it quilted for me. Hope you have a big week and all goes well for you and yours. Labels: Sassy 16, Smash Your Precut Stash! I found out last week who won the Modern Christmas Quilt...Linda Kay Barbour, mother of my across the street neighbor and very sweet lady!! I was so excited to find out she won the silent auction for the quilt. The other day I was on Facebook and Stitchin Heaven in Texas was doing a live broadcast and said if you left a comment you could win a prize, so I said "Hi from Mississippi" and next thing you know they called my name and sent me this book! My latest project is a quilt for William and Laura. William is Anne's nephew and Laura is his fiancé'. They are getting married in June. 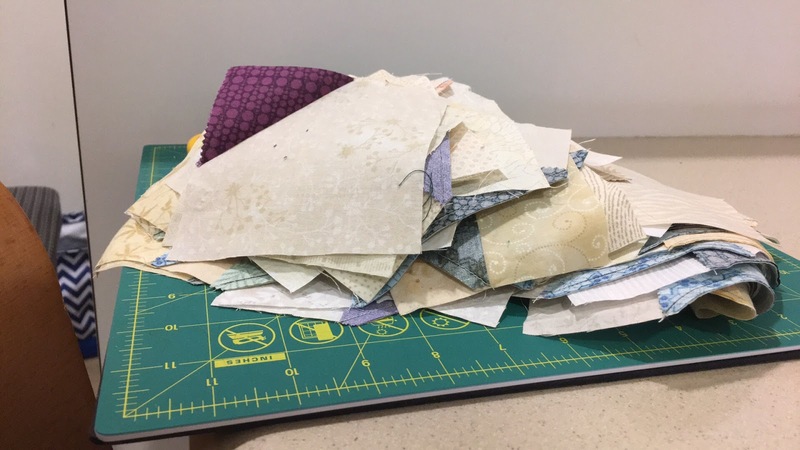 My project is out of the book Smash Your Precut Stash! I am doing the Sassy 16. The pattern designers called for all the background to be the same fabric. I chose to do it a variety of creams and whites. So Friday we were out of school for Good Friday and my car had a recall on the airbags which is a 5 hour repair. So I packed up my Featherweight and the project and took it with me. So I sat there and sewed 168 flip and stitch corners and made strips of the 16 patch blocks. I need to get going on this so I can get it to them by wedding day...hope I make it!